A good friend of mine had the vision to make a memorial to lost cats at Burning Man 2016. It would be a whimsical project with a deeper side to it to honor our fallen feline companions. 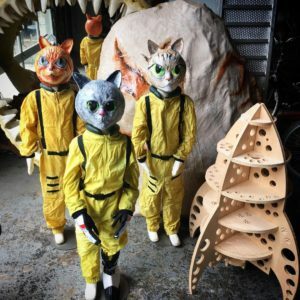 To see more of what is behind the project can go to see the Spacecats Indiegogo at https://www.indiegogo.com/projects/art-installation-for-burning-man-spacecats#/ . I was asked by her to assist with creating the rocketship part of the project for the intrepid spacecats. 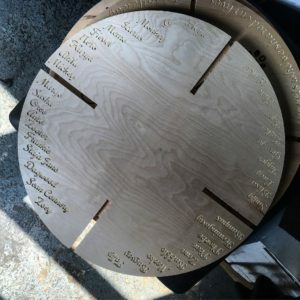 I just starting doing CNC work this year and leaped at the opportunity to further improve my skills with a big project. Over a period of 2 months many models were created to arrive at the final form. I will detail the workflow for this and share some of the iterations! 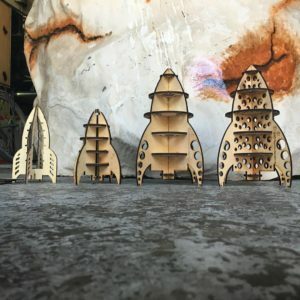 It all started with Fusion 360, a great program for makers, to create a basic rocketship model. Well, I thought it was basic but my inexperience made it a bit harder than expected and went through many hours of “learning time” to arrive at a model I was happy with. From making the 3d model in Fusion 360, I then took it to 123d Make to have it piece together in radial slices so that it can be put together in real life! With the parts generated from 123dMake I was able to create some laser models to show my friend and get her input for her vision. As you can see it took about 4 times to get it right. These models were done 1:10 scale then 1:7 scale. it really helps to have something in front of you to decide what will look best. After finally arriving at a model that was good it was time to bring it to the shopbot for a 1:2 model (that is also one of the indiegogo rewards!). There was much dialing in to make sure that the slot fit was tight but not too tight to be able to fit the pieces together. Found that adding in .01 helped immensely to get the perfect fit. I did many test notch pieces to ensure the fit. One problem I had was making the test pieces too small so it did not get the full effect of sliding all the way into the wood. I found that making them larger really helped. It paid off to prototype and make test pieces , saved me from wasting many materials , especially when I moved to the more expensive wood! Finally, we had something that the Spacecats seemed somewhat happy about – other than that orange tabby Floyd at least! Also learned how to use a V bit for this project , very challenging to get the right font in so that it looks nice but was not too thin. This is the plate with the names of departed cats. And finally , was able to do the full-size model that will go out to burning man! They were displayed at an event last weekend that was a Hawaiian luau, they seemed pretty pleased with it if I do say so myself! If curious about the indiegogo project and the other elements of the installation can check out the page at Spacecats . 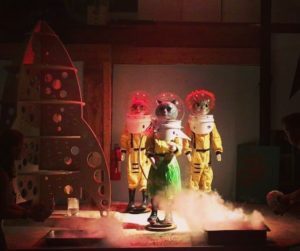 And if going to Black Rock City this year, look for some spacecats in the deep playa!